A research program between Arup and Qualcomm that would imagine what future experiences might look like within the convergence of future technology, mobility and the built environment. To start off the program Arup and Qualcomm came together to think about scenarios for future user experiences. This collaborative workshop consisted of Arup integrated transport and mobility consultants, Qualcomm technology consultants, and a range of participants working across the intersections of technology, mobility, and city environments. As part of the Foresight + Research + Innovation team I assisted with the creation of day in life scenarios for four potential future users. This set the scene and conditions for potential pain points for the users as well as opportunities for technology and mobile interventions. I designed the visual frameworks for the workshop and contributed to the analysis of participant insights. The workshop insights became were the starting point "Intelligent Connectivity for Seamless Urban Mobility". Intelligent Connectivity for Seamless Urban Mobility explores a future vision for urban mobility which includes new choices for individual trip-making, better information for smarter decision-making, and system optimization to utilize infrastructure efficiently; all in service of fostering a seamless, safe and sustainable travel experience. 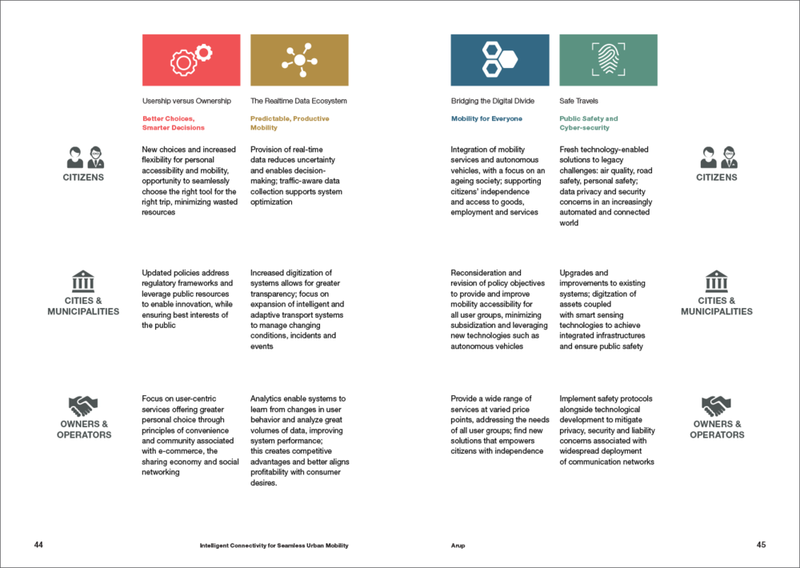 For each persona type I collaborated with Arup Foresight Consultants on a more detailed descriptions, matching emerging trends and expanding on user journeys based of workshop insights. 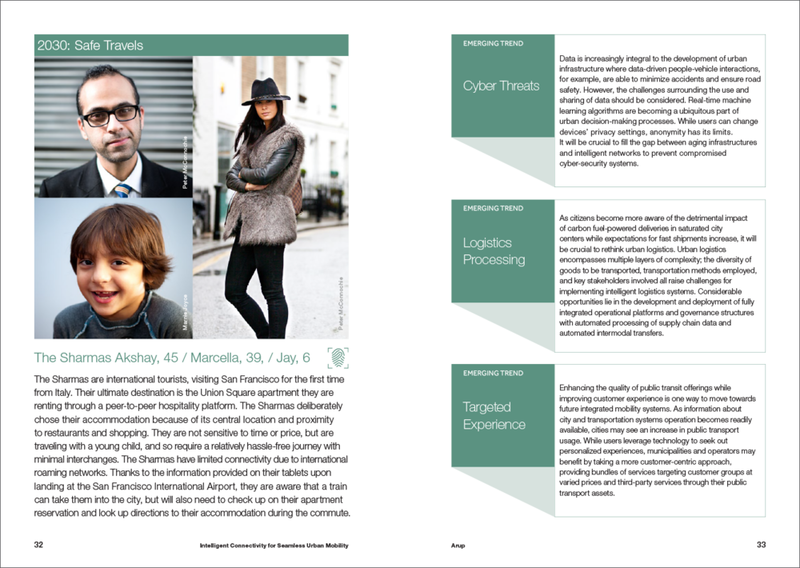 Each persona had a unique point of view in regards to how they use technology and how they travel through the built environment. 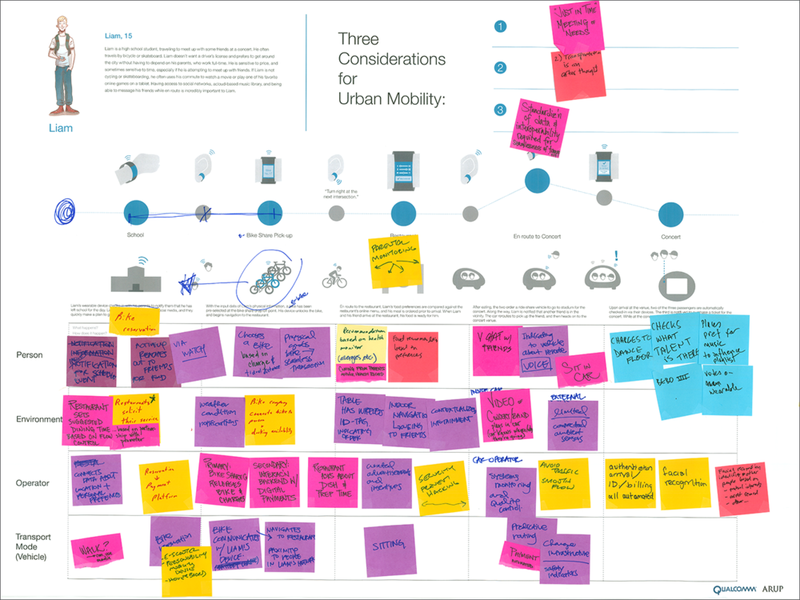 The types of user journeys we created informed Qualcomm on what types of integrated technologies they could potential create in an urban setting. Intelligent connectivity enables the symbiotic exchange of data between individuals and smart systems. It facilitates new models of on-demand mobility services. It supports electrification of transport and smart systems. It facilitates new models of on-demand mobility services. It supports electrification of transport and the rapid development of improved safety systems. 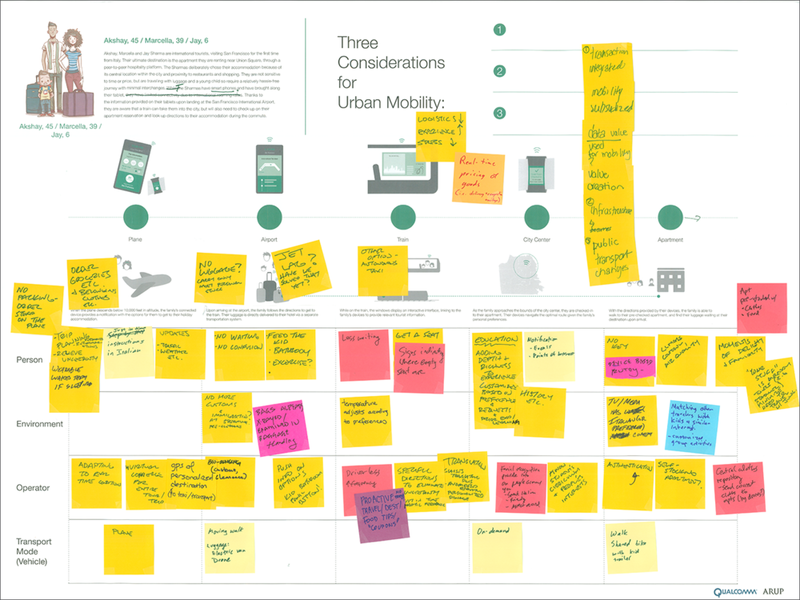 Our recommendations mapped the persona types across a matrix of types of usage: citize / individual scale, cities & municipalities, and owners & operators. 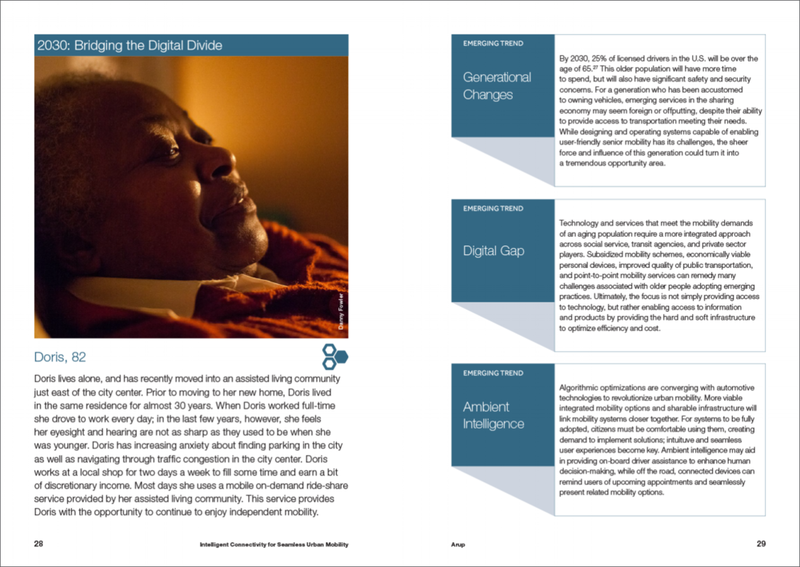 This matrix enable Qualcomm to not only think about the personas, but to also think of the implications of smart mobility on a city and operations scale. 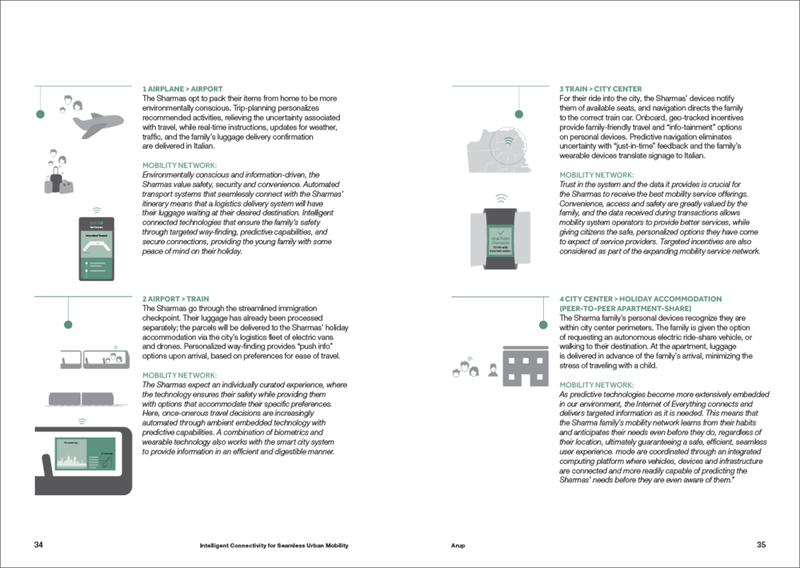 Our final set of actions and outcomes enabled decision making across technology and the built environment, we identified data, infrastructure, and policy as three touchpoints to enable change. The outcomes section details out the benefits to our recommended actions.